Lanka's boulder stream rivers are the ideal setting for white water rafting. This is the best way to see the stunning environment what this region has to offer. Many tours are arranged and it begins with days of action, rafting the white waters. This high adventure is suitable for fish time ‘go for it' rafters and experts alike. Along one ride you can pass the scenic location outside. Rafting has become a very popular exciting get safe adventure sport option. If you're looking for an action-packed adventure on the water, why not go for a white water experience in the numerous rapids found in Sri Lanka ? This activity is great fun for first-timers and experts alike, with a wide range and grading of rapids on some of Sri Lanka 's more turbulent waters such as the Kelani river. Kitulgala in the hill country, southwest of Kandy provides an ideal base from which many white water rafting tours take place. Tours can be arranged for anything from 1 hour to a half-day including lunch. Approximately 80 kilometres from Colombo on the A7 - the road to Nuwara Eliya via Avissawella - is Kitulgala, a pleasant town whose name is derived from the kitul tree, vast numbers of which grow in the area. Kitulgala had a brush with fame when it was chosen as the location for David Lean's 1957 epic, Bridge on the River Kwai. The film crews and stars may be long gone, but many still stop here to gaze across the Kelani River where once stood the most famous bridge in cinematic history. You have to use your memory to fill in the missing timbers, but as the film is screened so often that shouldn't be a problem. Sri Lanka's spring fed boulder rivers flow through wild tropical jungles are the ideal setting for white water rafting. 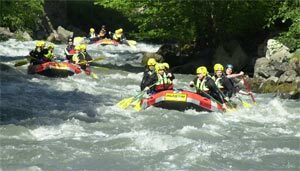 Whether it's a half day or full day excursion or as an activity of a multi day tour itinerary White Water Rafting is a must do activity for young and not so young alike. This activity which doesn't require swimming capabilities at all is ideal for the amateurs who wish to 'take the plunge' and for experts as well. Our main rafting location Kithulgala had a bout of fame, when it was chosen as a prime location in the filming of , David Lean's 1957 award winning film 'Bridge on the River Kwai.' 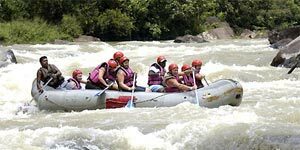 The Kelani River ( one of the main river's of Sri Lanka) flows through the Kitulgala's rock strewn sections and the rapids provide ample pleasure for the adventure sport of white water rafting. The actual run takes about 1 ½ hours to 3 hours[ depends on how much time you want to spend in water to complete with encounters of grade 2 and 3 rapids, bearing unique names such as Butter Crunch, Killer Falls, Head Chopper and Virgin's Breast !